"Visual Studio Deployment" == Fail! Which part you want to run automatically is, of course, your own decision. Maybe you prefer to deploy just on the staging surroundings or directly on the production surroundings - doesn´t matter. Round about the management for Windows Azure Microsoft offers a REST surface. But in fact, it´s a bit exhausting to use the API directly. From Microsoft too (and maybe from other volunteers, it´s open source) there is an Azure Management Cmdlets available (Powershell!). With every security update the version number changes - for me, I entered the Version "1.3.20121.1237" manual. It works, at least for me and the installer runs successfully after that. 1. Load the IIS 7 management console. I´m assuming here you have IIS7 installed since its required for the Windows Azure SDK. 2. Click on your Server. 3. Double Click Server Certificates in the IIS Section in the main panel. 4. Click Create Self-Signed Certificate... in the Actions panel. 5. Give it a Friendly Name. 8. 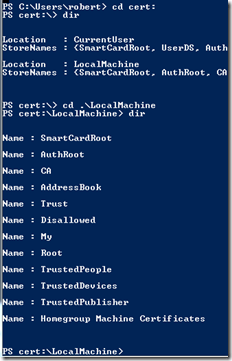 Open Trusted Root Certification Authorities, then Certificates. 9. Look for your certificate (Tip: Look in the Friendly Name column). 11. In the Wizard, choose No, do not export the private key, then choose the DER file format. 12. Give your cert a name. (remember to call it something.cer). Now we talk about the Buildprocess. The most important step is to open MSBuild. 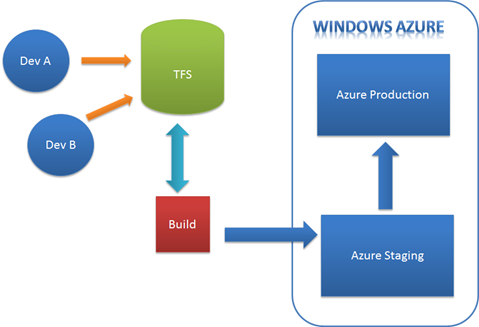 The step I´ve made before isn´t important for the Azure Deployment. It´s also important to define the Working Directory to navigate in MSBuild. Beware: MSBuild needs to be in the x64 mod if the server is a 63bit machine. It looks like the Azure Management Cmdlets are only installed in the 64bin mod. As target I call "PrepareAzureDeployment" and enter as properties my subscription key and the location of the certificate. But I only do so because BizzBingo is Open Source and because of that I can´t save the sensitive information´s into the file. 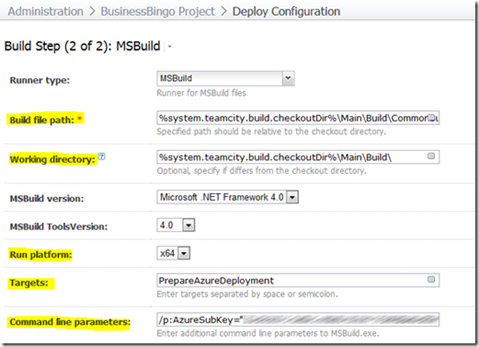 To build the Azure package I call the fitting MSBuild Target in the Azue project. Here I navigate with the help of "$(MSBuildStartupDirectory)" (therefore the WorkingDirectory in TeamCity) and call "CorePublish" with the accordingly configurations. Side note: Because of MSBuild runs in the x64 bit modus Powershell is used to be called in the same mode. Otherwise the Azure cmdlets won´t be found! Main parts of the powershell script are from the Windows Azure Guidance from the p&p team of Microsoft. More descriptions you will find here. A typical error message was for me: "The HTTP request was forbidden with client authentication scheme "˜Anonymous´.". That means you´ve entered a wrong subscription key. In the MsBuild step we did before I´ve build the package and I´m able to navigate to this place. Now it´s checking up if there is something going on in the staging surroundings and if there is something, it will be stopped. Now the deployment starts and the instances will be turned off. The addition "WaitToComplete" takes care that every action will wait till the last one is completed. In Line 1 the built package will be deployed on the staging surrounding. Now the workaround starts: To switch from "Staging" to "Production" the staging needs to be booted up completely because otherwise you will have an ugly downtime on the "Production". So I wait for 400 seconds. That´s the time the azure project needs to initialize and start. The task is from the MSBuild community task project. Now the started staging surroundings will be "swapt" to the production. Same game at the beginning: took Key/certificate and check Snapln. Now it took the deployment on the staging and makes a "Move-deployment" and it makes a "Swap" like in the webfrontend. After that I should down the staging surrounding and delete it because it produces costs. The process may look a bit difficult but it isn´t with the Cmdlets I´ve showed you. The main barrier for me was the problem with the error message of the Azure Cmdlets. - Wait a little bit - maybe buggy? The Code is on Codeplex and the webpage is available on www.BizzBingo.com.